Instant Imprints Bonita Springs, FL | Custom T-Shirts, Embroidery, Signs and More! At Instant Imprints Bonita Springs in Bonita Springs, Florida, our customers come to us when they want to be more visible to their customers. We create that visibility five different ways: Branded Apparel (embroidery), Signs & Banners, Promotional Products, Custom T-Shirts and Print Services. If you're looking for unsurpassed customer service, quality work and great pricing, this is the place for you. I drive 20 minutes passing numerous printers to have all my work done here. You can't beat perfection! Is your business looking to take its advertising to the next level with custom t-shirts, printing services, promotional products, custom banners or branded embroidery items? Your solution is right here, at Instant Imprints in Bonita Springs! All across beautiful Florida, businesses are taking advantage of custom promotional goods in order to integrate themselves into the daily lives of their customers. When you showcase a brand image that is professional, consistent and pleasing to the eye, you are helping to foster that crucial connection between your brand and potential customers. So come into Instant Imprints and see what our Bonita Springs Image Experts can do for your brand! If your ask your favorite digital assistant, “Where’s the best place to get promotional items near me?” There’s no doubt that Instant Imprints in Bonita Springs will be at the top of the list! We have everything that you need to represent your brand in a superior way. Since your project is completed all under one roof, right here in Bonita Springs, you know that you’re getting the best that Florida has to offer. In addition, we pride ourselves in getting your job done right the first time, so you can avoid the costly revisions that home or office print jobs can bring about. Custom t-shirts are tried-and-true ways to reach more potential customers, wherever they may be. Your custom tees serve as mobile billboards, spreading your brand awareness wherever they go. Our multiple production methods means you can use the perfect process for your particular project. If you need help on deciding which customization route is right for you, our Bonita Springs Image Experts are more than happy to help. Get the best t-shirt service around with Instant Imprints! 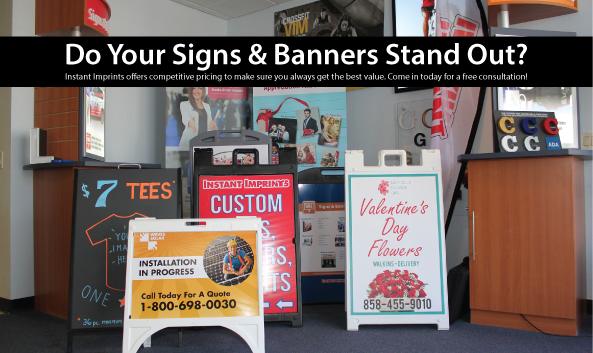 When your business needs to stand out in a big way, our custom signs and banners are for you. No matter what size project you have, we can deliver a custom sign or banner to fit your particular needs. Perhaps you want to make an impact at your next industry conference with a professional trade show display, or you’re looking for a personable sidewalk sign to invite the public into your storefront. Reusable banners are durable ways to bring your logo wherever it’s most effective. All in all, custom signs and banners help you make a greater impact on prospective customers around Bonita Springs and beyond. When you’re ready to ramp up your brand visibility and see what promotional product possibilities are out there, come by our Tamiami Trail showroom, give us a call at (239) 949-4499 or request a quote online today.